People of all faiths share histories of intolerance and persecution. In the early decades of our existence, Quakers were feared and the practice of our faith was against the law. We were persecuted, imprisoned, tortured, and executed in England and in the colonies that later became the United States. We recall these shared struggles for acceptance when religious freedom is threatened. We are taught by our faith and experiences to embrace understanding and compassion and the quest for truth. 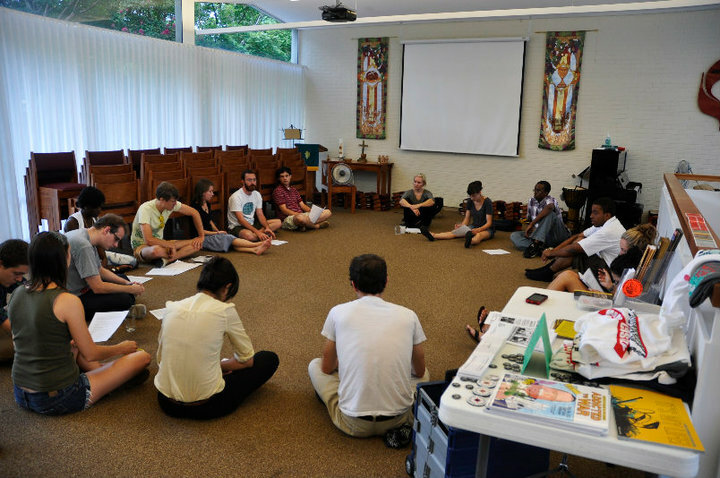 We bring a commitment to peace and the use of non-violent means to resolve conflicts. We were here in New York City on September 11th, 2001, and mourned with the loved ones of individuals of all faiths who were killed or injured, reaching out to that of God in each and every one. We experienced the loss of a sense of security and well-being. We, too, experience the pain and grief that remain. We have worked steadfastly with victims in the aftermath, and have challenged actions that lead to further loss of life. We concern ourselves with the threat of harm when those on different sides of disputes cast “the other” in the role of the despised and deny their voice, their humanity, and their rights. We call now, as we did then, for the end to the cycle of violence. The controversy over Park51 reflects our own human condition. We need to look unflinchingly at this less-than-inspirational image of ourselves and use it to gain wisdom, rather than distracting ourselves by creating further discord. The discord reveals that although some have mended, for others, wounds remain unhealed. Honest differences continue over whether retaliation is justified and is a precursor to strength and security; or whether retaliation is a futile act inviting the escalation of hostilities and greater forms of violence. Differences also continue over whether skepticism and distrust are necessary and valued as a way to protect ourselves; or whether optimism and trust are productive values to act upon. As Friends organizations we adhere strongly to the latter worldview in each of these instances. engagement. The Center’s proponents are extending themselves in friendship, with a vision of a vibrant and diverse interfaith community and nation. The controversy surrounding the Center must not further threaten individuals, our city, or our nation. As disparate as non-Muslim opinions may be on the building of the Center, so too may be the feelings of Muslims whose privacy is again catapulted into the public sphere, and their security made more vulnerable. We must work together to stem the rising tide of fear and the threat of harm and persecution and violence here and throughout the country. We stand with those who fear recrimination and retaliation for their views or their membership, whether they be Muslims or otherwise. We call for the end to political posturing and purposeful misstatements that poison dialogue, stigmatize individuals, inflame the worst in our human nature, create divisions in our society, and promote a view of America as anti-Islam. Such demagoguery has no place in our society, and stooping to it for political gain is unconscionable. * What religion has not had terrible acts committed in its name and in violation of its most basic beliefs? * What do we understand to be “hallowed” ground? What do we understand to be its proper uses? * How do we understand and reconcile our pain and the pain of others? How do we truly listen and mend the wounds of loss, suspicion, and hostility? We have had centuries of experience reaching out to those characterized as “the enemy,” finding and connecting with the Divine which resides in us all. We know that violence and intolerance breed more of the same and that extending ourselves in love and compassion can have a profound impact on even the most hardened of hearts. We support open engagement, civil dialogue, and deep listening to truly hear what is being said and meant. We believe and pray that God’s enduring power and love can guide us to a positive way forward. This is our faith. 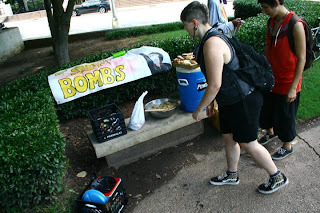 On August 18th, during Atlanta Food Not Bombs(FNB) regular feed at Hurt park, members of FNB noticed police harassing one of the folks that came out to share a meal with them. Several FNB members confronted Atlanta police officers who had targeted the man while he was laying down in the park. FNB members noted that there were numerous people relaxing in the part and questioned why this man was being targeted. FNB then asked numeruous times if the officers would give them their names and assignment numbers to no avail. The police escorted the man from the park, seemingly accusing him of vagrancy. In What appeared to be retaliation several Atlanta police officer confronted FNB demanding to see a permit t serve food and when FNB was unable to produce a permit(which they asserted they did not need to have) police forced them to leave the park and ordered them not to return next week without a permit to serve food. FBN put a call out to folks in their network to come out and support their August 25th feed at Hurt Park and AFSC was all to happy to see what we could do. Before the scheduled 5pm meal I printed off several copies of the ACLU letter which asserts FNB right to serve food at any Atlanta city park. The letter highlights the FNB lawsuit victory against the city of Atlanta in 2000. The lawsuit being a result of past police harassment toward FNB feeds in the city. When I showed up to Hurt park it was clear that others had answered the call to show up and support FBN right to feed Atlanta, and it was clear that FNB was also prepared having brought their own copy of the letter. After just a few minutes into the feed five police officers showed up and stood at the edge of the park. One came down and asked if FNB had obtained permission to feed people. Jose Sanchez, with FNB, presented the letter to the police officer and after the officer read the letter he then backed down and the feed continued. The police did not simply leave though. Four officers conitued to circle the group for the remainder of the feed and at one point one of the officers went out of his way to started an argument with a FNB member over her right to ask his name and assignment number. It's clear that FNB will likely continue to face a shockingly aggressive police force at Hurt Park. AFSC plans to continue to support their feeds, bringing our witness and an empty stomach to their Weekly feed at Hurt park(Edgewood & Courtland) on Wednesdays at 5pm. See you there! 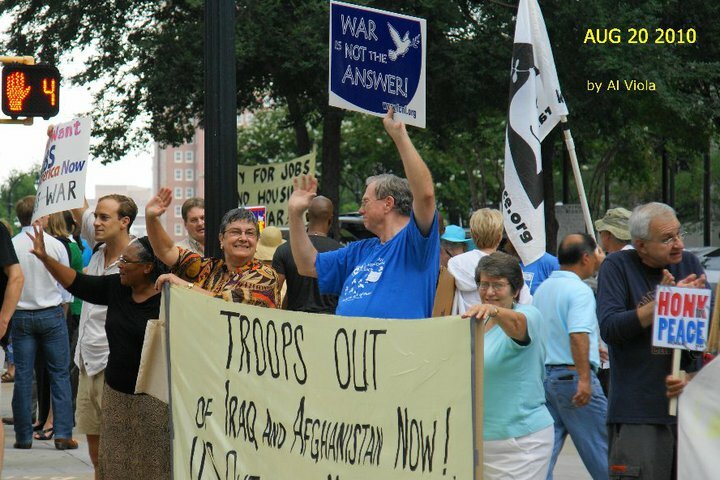 During the build up to the Iraq invasion of 2003 members Georgia Wand put all call out to the Atlanta community to hold a weekly demonstration outside of Zell Millers office. 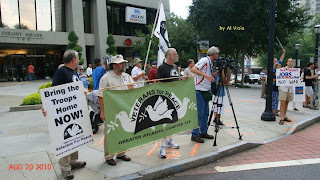 Members of the Georgia Peace and Justice Coalition, Every Church a Peace Church, Concerned Black Clergy, Veterans For Peace, American Friends Service Committee, the International Action Center, and many others answered the call. 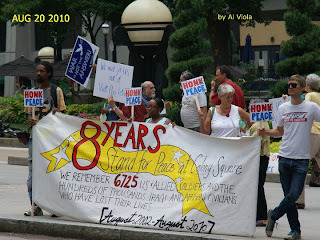 Demonstrations outside of Miller's office at Colony Square against the Iraq war began in August of 2002 and have continued since. Through the years the number of folks that come out has gone up and down but Georgia Wand has remained committed to keeping that corner of Peachtree and 14th occupied by folks with a message of peace and resistance of war in Iraq and Afghanistan. They continue to meet at Colony Square(Peachtree & 14th) weekly from 12-1pm. 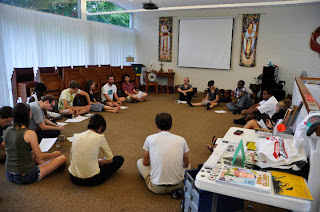 Today was an exciting day as AFSC begins an experimental curriculum with local high school Horizons. Each Wednesday morning for the next 8-10 weeks, AFSC will be leading the entire Horizons student body (about 50 students) in a pilot program that will take the "Be the Change" concept used at the May youth convergence and put it in an interactive classroom format. Just like the convergence, we will use Dr. King's April 4th, 1967 "Beyond Vietnam" speech as a grounding text to frame our discussion as we connect the dots between the "giant triplets" of racism, militarism, and poverty. And just like the convergence, we hope to spend part of the time educating students and doing skill building and the rest of the time allowing students to begin planning for themselves how to be the change in their communities. UNLIKE the convergence, we aren't working with a group of youth (mostly college students) already engaged in their campuses and communities coming together on purpose for a weekend convergence. Instead, we are working with 8th-12th graders with varying levels of awareness about these issues. So, we began the first session with a discussion about where "Be the Change" comes from, and why the quote is relevant. Who was Gandhi? What did he have to do with Dr. King? Tim asked the students for examples of other leaders who chose to "be the change they wanted to see in the world." Answers ranged from Abraham Lincoln to Michael Jackson. Next, Tim asked for volunteers who could read our grounding text, the April 1967 "Beyond Vietnam" speech, with a little bit of King's confidence. 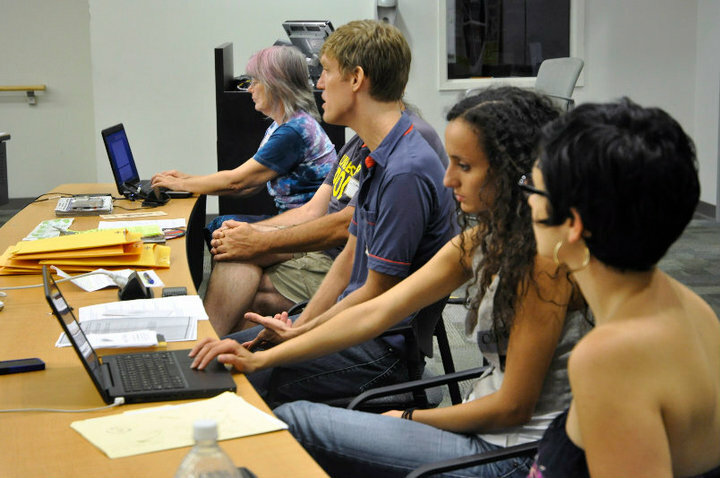 Our volunteers stepped up to the plate, and together we read the entire speech. Students did a great job engaging with the text as we discussed some of the background of the time period, including the Vietnam War and the Civil Rights Movement. After the exercise, students who put their paperclip money in the "Missing areas" bowl shared what they were thinking of, like water and technology. Then, Tim confessed that two of the areas were made up: The Arts (which is really a small fraction of the "Other Agencies" category) and the Dept. of Peace (which doesn't exist). Next we passed out AFSC's "One Minute for Peace" pamphlets revealing the national government's ACTUAL budget, which was met with cries of disbelief and a few expletives as the students realized their dinky 6 paperclip percentage points of military spending did not come close to the 57% of the actual budget. We hope this eye-opening exercise will lead to a lot of discussion as students continue working with Dr. King's speech for their homework assignment. Next week we'll keep digging into Dr. King's real issue-linking legacy with a field trip to the King Center! Stay tuned! 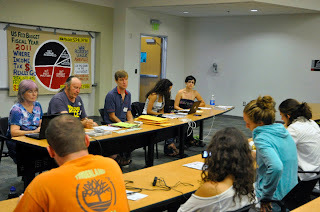 AFSC Seeking Awesome Volunteers/ Interns for Fall Semester and Beyond! 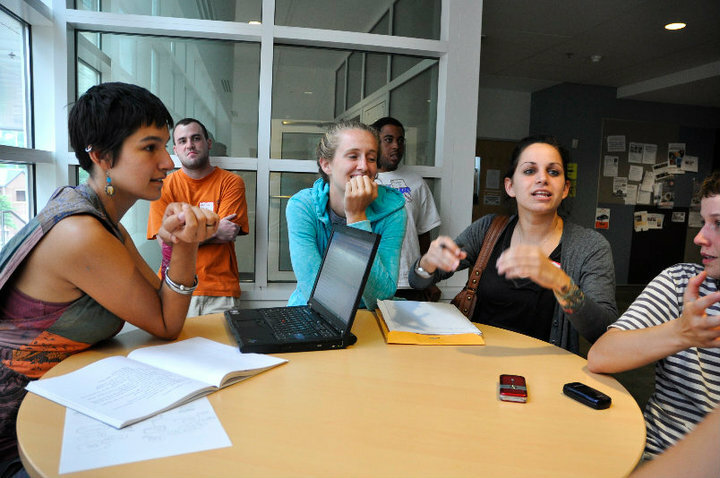 As the fall semester gets underway, it’s time for students and non-students alike to consider anew how to best commit our time and how to most effectively make change in our communities. If you find yourself supporting peace and justice events sporadically throughout the year, why not make the jump to being a volunteer so we can draw on your skills and talents in a more impactful way?? 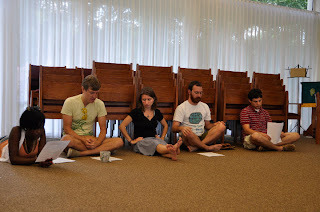 AFSC’s Peacebuilding Program could not exist without the contributions of committed volunteers and interns. To better highlight these contributions, we will be featuring volunteers and interns in this blog throughout the year. Today’s intern is Seema Reddy. Seema began interning with AFSC back in April. She works on a flexible time frame around her work schedule based on the needs of the program. Seema participated in the counter-demonstrations when the Westboro Baptist Church came to town in the spring and will surely be involved in other AFSC events in the future. However, she mostly works behind-the-scenes to increase the program’s capacity and efficiency. She has helped organize the office, do data entry, and run errands. One of her main projects thus far has been to increase the effectiveness of this blog. She set up analytics on the blog to help us track where most of our viewers were finding out about it, so we could reach more people. Seema became interested in AFSC’s work after meeting Tim Franzen and hearing about the Movement to End Israeli Apartheid and the Student Career Alternatives Program. When asked about her motivation to get more involved, she responded that she’d always been aware of the issues but didn’t become active until she realized Tim’s work was a “good way to live” and got inspired to get involved. Seema looks forward to the work to come and hopes to gain some things as well, like techy know-how and connections with people with similar values. During our interview, Seema commented that she was really impressed by the young people in Atlanta and that her favorite part of volunteering with AFSC so far has been meeting young people that are already so eager to be involved and open to ideas. Thank you, Seema, for all your work! It’s that easy to volunteer! You’ve got skills, and we need ‘em! The Peacebuilding Program has many components and many needs. You can table at a local high school with SCAP to provide non-military options for high schoolers to consider after graduation. All it takes is a one-time training session, and we provide all the resources. We are always on the lookout for artists and musicians of all sorts to help out at events and fundraisers. Are you computer-savvy or graphic-design-savvy? Help create our posters and pamphlets. We need promotional people organizing via internet and on the ground to help keep momentum rolling on various projects, from the SCAP Art Contest to the MLK Justice Tour. You can join one of the four "Be the Change" committees to help combat the education crisis in Georgia--legislation, art, direct action, or media. If you’d like to make a contribution to AFSC’s work through volunteering or interning, please contact Tim at TFranzen@afsc.org or Erica at erica.scap@gmail.com. 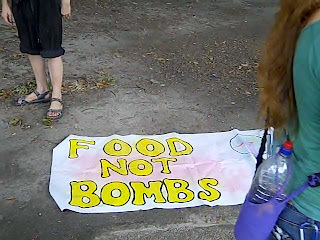 Georgia State University police told Food Not Bombs members that they were not allowed to serve food in Hurt Park. Food Not Bombs, a group that says food is a human right, was serving a free meal in Hurt park on Wednesday, August 18 when a police officer ordered a nearby man to leave the park because he was lying down. Copwatch members who were present began filming the incident and followed the police officer and the man onto the sidewalk. The officer ordered copwatchers to go back into the park about 40 feet away, threatening to charge them with "obstruction", while other passers by were allowed to walk right by the officer. Soon, more officers arrived and began talking to the man who was being kicked out of the park. When the cops were done speaking to the man, they came up to copwatchers and began questioning them about the Food Not Bombs meal. 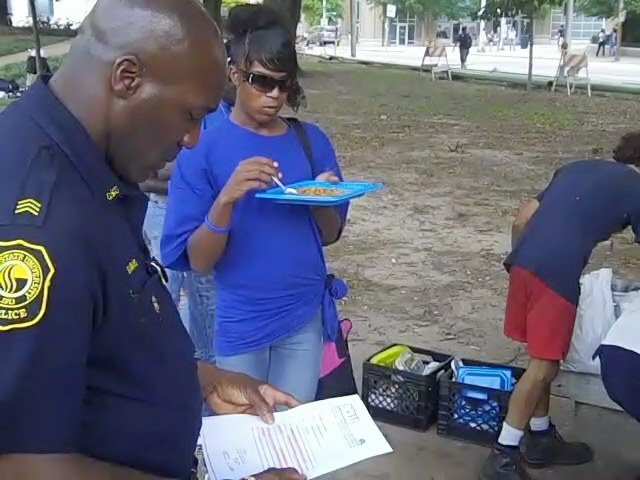 The police claimed that it is illegal to serve food in the park and demanded to see a permit. The police threatened to throw away FNB's food and dishes if the group did not leave the park. The meal was almost over anyway, so FNB members decided among themselves to take their supplies and leave. Some speculated that the police attention on Food Not Bombs was retribution for the monitoring by Copwatch. According to Vincent Castillenti, the Copwatch cameraperson, "I don't think that they would have been concerned with Food Not Bombs if it hadn't been for us filming them." This incident is not isolated; it comes in the midst of a campaign by the city to make the downtown area hostile to the homeless in an attempt to drive them away. Homeless people who frequent Hurt Park say that police harassment is a common event there. 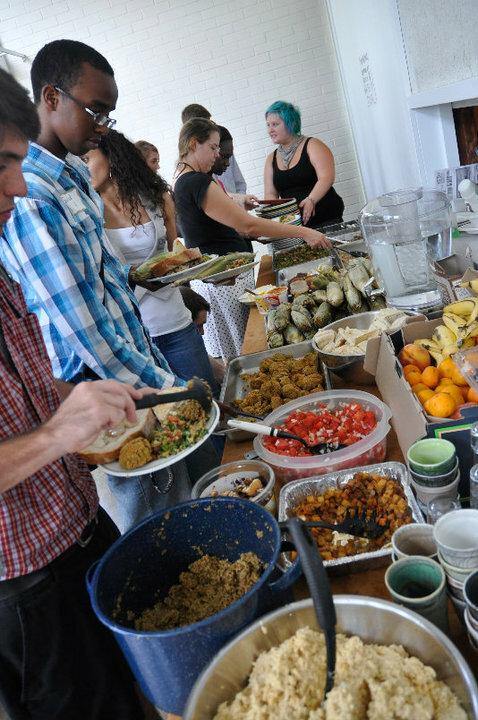 In 2000, Food Not Bombs won a lawsuit against the city after the group was prevented from serving serving food in public parks. Food Not Bombs is likely to face harassment again from these and other police. As the GSU school year begins, police are likely to start cracking down on the homeless. Food Not Bombs is requesting that people come to Hurt Park on upcoming Wednesdays at 5:00 pm to partake of the meal and to bear witness if further harassment occurs. Day two of the conference brought more high temperatures, good food, and lively discussion. 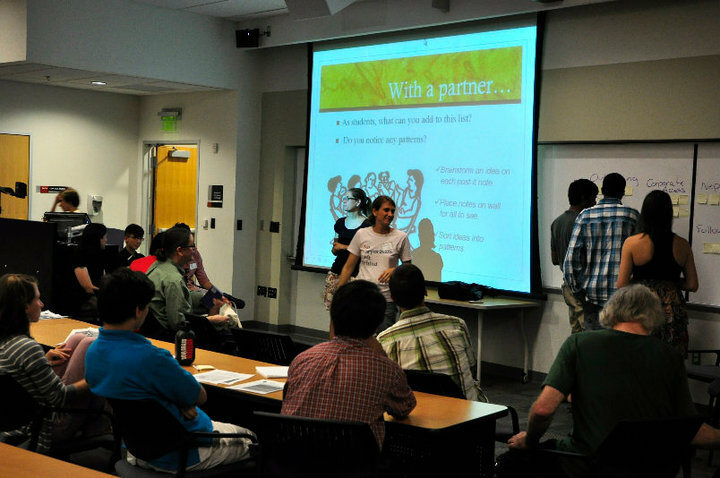 We gathered back at the Georgia Tech campus for breakfast and then went into our first session: the Be the Change meetup in which "be the changers" got a chance to introduce themselves to Georgia Students for Public Higher Education and share ideas for collaboration. Art- This committee so far has projects mostly in mid Georgia because its coordinating group, Art as an Agent for Change, is located in Milledgeville. They are working on a literary arts magazine as well as a college/high school mentoring collaboration which will hopefully result in a mixed CD of education related hip hop tracks. We are looking forward to this committee coordinating with others around the state to spread "art for education" projects to other cities. Action- This committee needs members and ideas! So far we know we will be supporting and participating in the October 7th day of action in which campuses all around GA will be doing some sort of coordinated action for public education. We'd also like to see this team coming up with creative ways to engage people on the issues through community service and local projects. Legislation- Although GA's legislative session doesn't begin until January, this committee is already doing the groundwork to prepare. We won't know until after the elections are over whether we need to support existing legislation or develop our own, but this team is already researching and forging relationships. We're setting up a conference call soon (details TBA!!) in which a legislator is going to explain the past and present status of legislation related to education and budget re-prioritizing. Everyone is invited to this call, so be on the lookout for details. Media-In the near future this committee will be creating materials, updating the website, and communicating the campaign's goals and projects to the media, but for now we are focused on creating a foundation of good research. We need the correct stats and info for our materials. To this end, we are hosting a guided research session at the UGA library in Athens on Saturday, September 11 from 2pm to 6pm. We will learn how to access government and budget info and end the day with a collection of solid information to use throughout the year. Anyone interested in education is invited, and travel stipends and free housing are available for those coming from outside Athens. After these report backs, we took questions and shared ideas about how K-12 and higher ed movements can partner together. We look forward to hearing more ideas and finding ways to link the demonstrations that are happening on both high school and college campuses. The last part of the conference on Sunday was the regional breakout session. Atlanta area folks got together to brainstorm ideas for October 7th and beyond, and the Athens crew got a chance to meet each other and form some strong bonds. Special thanks: Wesley Foundation for use of their lovely building, Caitie Leary for photos, Food Not Bombs for food, GSPHE organizers for a great weekend! Student Career Alternatives Program (SCAP) was invited to participate in a panel alongside The Movement to End Israeli Apartheid, and the War Resisters League entitled, "How the Anti-War Movement is Pro-Education". 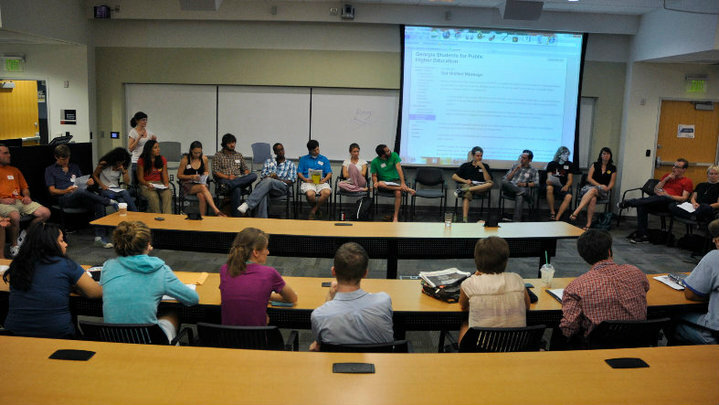 The panel was part of Georgia Students for Higher Education's summer conference. SCAP, a project of the American Friends Service Committee, has long viewed the bloated war budget as a robbery from our communities. We don't see our national budget as some sort of shopping list but rather a list of national priorities. It is through this lense that we view our current national priorities with great alarm. 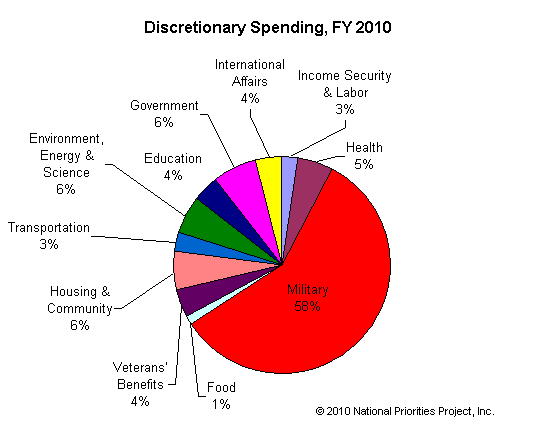 This year our federal government will spend more than 50% of it’s budget on the military industrial complex while only spending 4% on education. One paradox is that as we drain programs of social uplift, like education, and siphon more and more tax dollars from our communities into the war industry, we create pipelines from low and middle income communities into the military and prisons. We only wish this was speculative, there's plenty of data that backs up this sad reality we live in today. During this economic crisis it's important that we begin to view the dollars and lives (of young recruits) that are taken from our communities to pay for these wars for what they are, a robbery from our society. Our national priorities should be educating our youth, healing our sick, feeding the hungry, and housing the homeless (many of whom are combat vets, still suffering the wounds of war). SCAP was honored to be invited to present on the panel and looks forward to helping GSPHE build their October 7th statewide action. Many of you already know that youth participants at this year’s, "Be The Change" youth convergence made the decision to focus on building a statewide campaign to address the attack on public education. 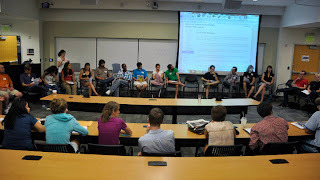 Having members of Georgia Students for Public Higher Education (GSPHE) at "Be The Change" certainly played no small part in the decision to focus on the current defunding of public education. We also recognize that the public education system (K-12 & Higher Ed) has serious systemic problems that have needed to be addressed for years. So it made sense from the get go for our efforts to be in step with GSPHE's, and what better way to make friends with them then by supporting their summer conference? 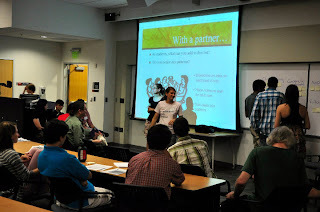 We were able to help outreach, present at, participate, and help fund their conference. GSPHE organizers welcomed be the changers with open arms, and even gave us plenary time on Sunday for us to have our report back, which will be expounded upon in a later blog post. 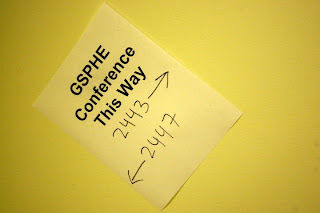 We were especially impressed with the program GSPHE had put together. On the first day of the conference workshop facilitators included folks from Jobs With Justice, Georgia Latino Alliance for Human Rights, Atlanta Public Sector Alliance, Metro Atlantan's for Public Education, and several anti-war groups. During the afternoon strategy session, which was facilitated by members of GSPHE, attendees decided that October 7th would be a day of statewide action in support of re-prioritizing education in Georgia. The hope was to link not only with those mobilizing folks all over the country around public education, but to also link with folks resisting the war in Afghanistan(Oct 7th is the 9th anniversary of war in Afghanistan), and those fighting for immigration reform. Food was prepared by the local Food Not Bombs group, food was amazing! There was a party at the big house which provided everyone the opportunity to connect on a more casual level.